I recently read a brilliant blog post over at 3 Children and It and I thought it would be a great fun way of sharing a bit more information on me, as well as being fun to write. A is for Arthritis. I have arthritis in my back, which was diagnosed when I was 18. B is for Baking. I love to bake cakes, although I have no skill or interest in cooking. I love the methodical process of baking and sharing my creations with friends. C is for Cheshire. I was born in Cheshire and lived there prior to age 3 and after age 10. My mum still lives there. E is for Event Organiser. I have worked as an Event Organiser for 5 years. F is for Fife. Where I grew up from age three to ten. G is for Gal Bladder. I had mine removed in 2000. H is for Horses. I have ridden since I was three. I gave up 4 years ago as we wanted a baby and I have a damaged back. J is for Judging. I am a British Dressage Listed Judge. K is for Kingskettle. The Scottish village where I grew up. L is for Lily and Lou Lou. My little dogs, rescued from the vets where I used to work. M is for Mummy. A position I have held for nearly 8 months. Definitely the most difficult, but most rewarding job I have ever had! N is for Nissan. I drive a Nissan Note. Just after I found out I was pregnant my car terminally broke. I used our saved IVF money to buy my little Nissan. O is for Oz. 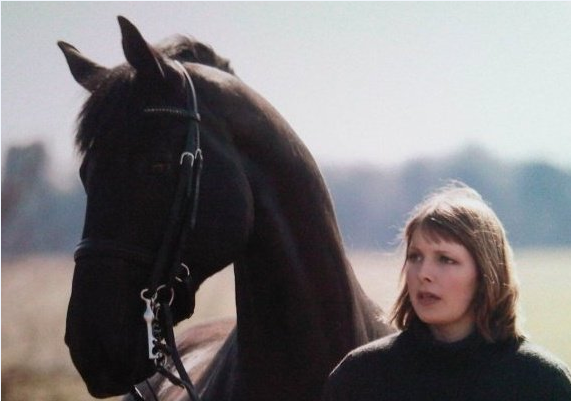 My beautiful horse, who was my partner for 8 years. Sadly he had to put down 1/2 years ago. P is for Psychology. I have a Psychology degree from Reading University. Q is for Quiz. I love a good pub quiz. Unfortunately my general knowledge is a bit lacking and so I can usually only answer the pop culture questions. R is for Reality TV. I have to admit to watching more than my fair share. S is for Spiders. I am truly terrified of them. T is for Tuna. I can’t bear it. Even the smell makes me gag. U is for UGGS. I know it may be sad, but I love my UGG (not real ones!) boots. They are so warm and comfortable. V is for Vermicelli. Often my dish of choice from the Chinese. W is for Wine. I miss it! I didn’t drink (apart from twice) in nearly two years, when trying to get pregnant and I haven’t had a glass since Baby has been born. I should add I am a heathen and mix it with lemonade! X is X-rays. I have had so many x-rays in my life. Mostly from falling off various horses!. Y is for Yazoo. Childish it may be, but I love milkshakes, especially Strawberry ones. Z is for Zoo. I love a trip to the Zoo. We recently took Baby and had a lovely day.